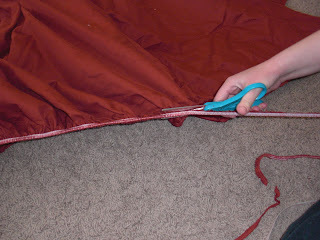 Obsessively Stitching: Tent Week, Day Two -- Hula Hoop Dome Tent! Tent Week, Day Two -- Hula Hoop Dome Tent! 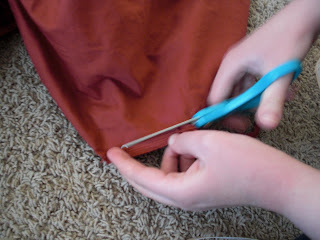 Today's tent tutorial is by my amazingly talented sister Elizabeth. 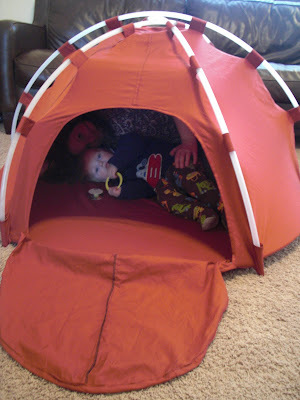 She came up with the idea for this tent a few months back, and I've been begging her ever since to write up a tutorial for my blog. At last, here it is! CLICK HERE for UPDATED PATTERN LINKS!! 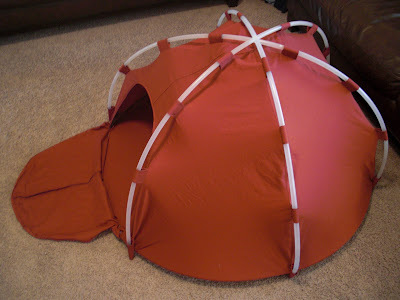 This adorable kid-size dome tent was made from hula hoops and bed sheets. The whole project cost less than $10! * King size flat or fitted sheet or a twin sheet set. 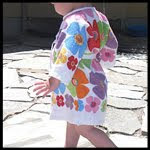 I recommend that you use fabric without a directional pattern. and remove the elastic so the sheet lays flat. Cut out the following pieces: 6 wedges, 1 circle with a diameter of 50", 1 door flap (three inches larger on the curved edges than the shape on the pattern, which is for the opening), 30 small tabs (4 3/4" x 3"), 6 large tabs (4 3/4" square). I had to piece together two of the wedges and the door flap in order to make it all fit on one fitted king size sheet. If you have to piece anything together, make sure to add an additional 1/2" seam allowance where you connect the pieces. I used the leftover scraps to cut out the door flap. Cut a doorway in the front wedge, using the pattern. 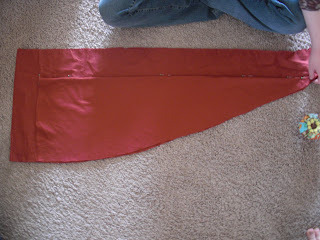 Using purchased or your own bias tape, bind the edges of the doorway. Sew a piece of velcro at the top of the doorway. Bind the round edge of the door flap with bias tape. Sew a matching piece of velcro at the top of the door flap. Hem the long sides of the small tabs and press. Hem one edge of each large tab. 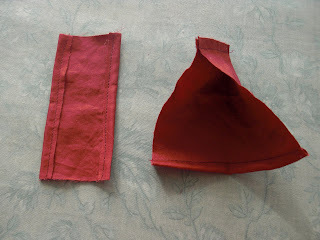 Fold each in half right sides together and sew across the bottom edge. Turn right side out and press. Lay the wedges right sides together, sandwiching the tabs between the two wedges. Pin in place and sew using a 1/2" seam allowance. Match up another wedge, pin, then stitch it on. Repeat with the other three wedges, creating two halves of the tent top. Serge or zigzag along the raw edges. 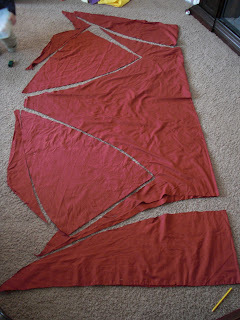 Pin the two halves of the tent top together, matching all 6 points of the wedges. 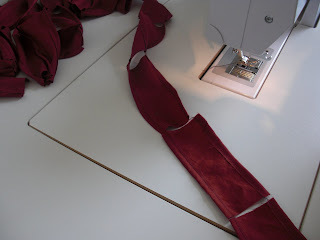 Sew together and serge or zigzag the raw edges. Fold your circle into sixths and mark each sixth with a pin. Match the seams of the six wedges with the marks on the circle. Overlap the door flap over the doorway and pin. Ease the bottoms of the wedges around the circle, pinning in place. (This will take some work to get it right, because your tent top may not be the exact size of the bottom circle.) 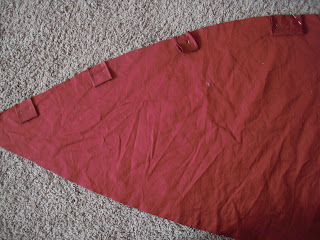 Place the folded tabs into the seam allowance on the corners of the wedges and in the middle of each wedge, so that this time the wedges are on the inside of the tent. Stitch around the circle. Take your hula hoops apart. On mine, they were wrapped with ribbon, which was taped in place, so it was necessary to remove the ribbon. 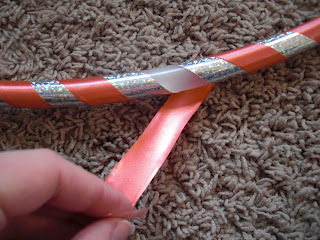 Find the seam in each hoop and pop it apart. (There will be a two-ended cork holding it together.) My hula hoops had a few small pieces of gravel inside to make that shaking sound when you hula, so be sure to watch for them and throw them away. Thread three of the hula hoops through the small tabs in the top of the tent and poke the ends into the large tabs. Hook the final two hoops together, using one of the two ended corks. Thread the connected hoop through the small tabs on the inside of the bottom of the tent. Cut one of the connected hoops using a saw as necessary to make the circumference of the hoop the same size as the circumference of the bottom of the tent. Use one more two-ended cork to hook the two ends together. Smaller version -- print and increase size 365% at your local copy shop. Or, save full-size version of pattern and print at local copy shop. 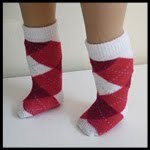 CLICK HERE TO FIND PATTERN LINKS!! Both you and your sister are just TOO good! That's freaking cool. 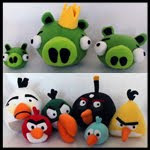 I will be featuring this at somedaycrafts.blogspot.com soon. That family of yours is BEYOND amazing! How amazingly dedicated. You are one creative seamstress. oh my gosh! that looks like so much fun. definitely have to move this to the top of my list. thanks for sharing, and thanks to your sister, too! This is really, really amazing! You have the most creative family, I love it! I'll be linking. That's just fantastic. I can't believe it was so inexpensive to make. 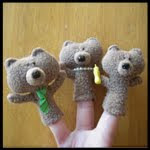 There are numerous things I see on these crafting blogs that I think I'd like to make one day... BUT THIS ONE WILL BE FIRST!! I can't wait. Seriously. Is your entire family crafty, or what? This is such a cool tent, and I LOVE the hula hoops for the frame!! Wow This is so amazing!! This is so cute! I linked on my Treasures for Tots Facebook Fan page! I know that the pattern is available to print, but can you post the dimensions of your angled pieces? This project blows my mind! I love it!!! I linked to it on my weekly roundup - thanks so much for sharing! I love this and would love to make it but can't print it at full size or scale it up. Would it be possible to get the dimensions of the wedge - sides, bottom and from point to centre of bottom. I don't have the pattern here (it's my sister's), but if you'll send me an email I can ask her to send the dimensions to you! I wish I had it in me to do this. Very cool. I featured this over at Today's Top 20! I'd love if you stopped by! If I print this to full size, what size paper do I need to use? LOVE this idea! Would you mind emailing me the dimensions? I'm having a hard time getting my printer to work today :P I would love to feature this on my sister and I's blog as well. Can't wait to make it!! Wow, that is just so cool! What a neat idea! could you possibly upload the pattern again? Scribd said there was an error processing the document. Thank you! This is wonderful. I would love to make it for my grandchildren. However, I am not finding a link to the pattern. Could you send me the link or the dimensions for the pattern pieces? This looks like so much fun! I am looking forward to making it, alas the link is broken. Could you please email me the pattern or repost it? I would love to make this for my kiddos, but the pattern link isn't working. :( Can you email me the dimensions for the pieces or the pattern link? I'm doing this for a Christmas present and want to get started ASAP! Please let me know when the link to the pattern is working. 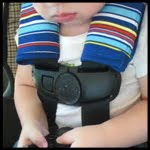 I want to make this for my 2 yr old Great-grandson. Do you have the pattern for this?? Please can you sent me the pattern? such a great idea!! i love it!! Brilliant! I just came across this on Pinterest. 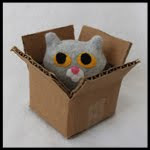 We have a toy ent already but it is none too sturdy and it's days are numbered I'm afraid. I'm so glad to have this tutorial for a replacement tent. I'll be keeping an eye out in thrift stores for king sheets with a fun design to them. Thank you! I'm not sure if you are emailing the pattern out, but I would love a copy. I would LOVE to make this, please. Please email me a copy to ehret_family@yahoo.com I would love to make one of these for two sons. Thanks, it looks like such a great idea, you are brilliant for coming up with this! Please add the bias tape and velcro to the list of materials at the beginning so people know everything they need to purchase. You could use irrigation tubing instead of hula hoops. Home depot sells it cheaply. Great idea! Your instructions are very helpful also. Your project inspired one that I just made, which will soon be visible on my sewing blog: fabricoftime dot blogspot dot com. Where do the extra 12 small tabs go? You said "for the bottom"...? Thanks for this awesome tutorial! I made a tent today! Great pattern! Thank you!